Mild intermittent explosive activity continues at the volcano accompanied by effusive activity. A new lava flow, smaller than the ones in the first weeks, but still well alimented, has been active in the Cha caldera over the past days and advanced slowly approx. 1500 m west-southwest passing between Monte Beco and Monte Saia cones. Still, short bursts of explosive and effusive activity occur from the vents occasionally, producing ash plumes and short-lived lava flows. Yesterday, such an increase resulted in an ash plume reaching 1.5 km and a new 50 m long lava flow near the vents. Minor ash fall occurred on the city of Sao Felipe. 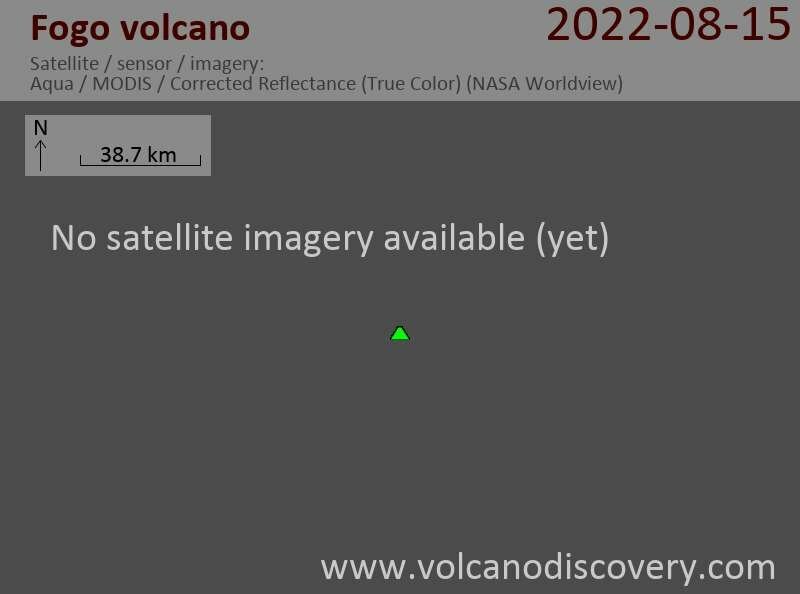 The eruption continues at reduced pace. After slowing down, lava effusion and small explosive activity at the vents appear to have increased again on 31 Dec. The western lava flow remains active with its northern front advancing through farmland in the Cha caldera. Still, the northern lobe of the recently active lava flow to the west remained active during the past days and smaller lobes advanced through more farm land in the Cova Tina area. Lava is fed through tubes to active breakouts at different locations inside the Cha caldera. One area with active breakouts remains the former locations of Portela-Bangaeira villages, where by now almost all buildings have disappeared. While the foremost front that had destroyed Portela and Bangaeira two weeks ago is no longer active, several lateral breakouts continue to spread in the caldera. For more than 5 days, no significant explosive activity and only minor lava effusion was observed at the vents. On the other hand, magmatic SO2 (sulfur dioxide) emissions remain high and even increased from 7,500 to 9,000 tons per day. That could mean that a new batch of magma is on the rise and lead to a rejuvenation of the volcanic activity. The next days will probably tell. The lava front stopped 600 m from what was once Bangaeira village, at 3.5 km distance from the next inhabited place, Fernao Gomes village, which could be at risk if the lava flows resume from there. On the other hand, if the old channels and tubes have now been blocked, which is likely the case due to lack of supply, new flows would need to re-start from the source and travel all the way to there first. In other hand, the threat to villages on the eastern coast now seems minimal. The abundant presence of gases and ash in the area of the Cha das Caldeiras caldera promts authorities to maintain a total access restriction. With 2 villages destroyed, more than 1700 people displaced and without some of their most valuable economic possession, farmland, this now 15 days old eruption is one of the worst volcanic disasters of the century. The history of 150 years of settlement in the Cha caldera is now under lava. If the eruption continues long enough, the lava flow, following the downwards slope, would eventually reach the eastern coast. The flow is now headed towards Bangaeira village, which is threatened to suffer the same fate as Portela in a short time. Authorities ordered full evacuation of the area. One of the main access roads, only opened a few days ago, was also destroyed again by the lava flows, making the evacuation of people and remaining goods difficult. At the eruptive fissure, 3 vents seem to still be active and explosive activity has decreased a lot. The eruption continues to be dominated by lava effusion. The intensity of the eruption has strongly decreased, and the lava flows that have been destroying Portela seems to have at least temporarily stopped. So far, the lava flows have destroyed approx. 50% of the village, 57 houses (37 of which yesterday) including the headquarters of the Parque Natural do Fogo, a school, hotel, 51 tanks, various agricultural buildings and a significant area, about 30 hectares of farmland. Several more houses have been burnt and destroyed by the advancing lava flows in Portela village. A SO2 plume is drifting south from Fogo and can be seen on satellite imagery. It reaches an altitude of approx. 9,000 ft (3 km), and has the potential to create acid rain. Gas and dust concentrations in the southern part of the island have been high enough to cause health problems (breathing disorders, vomiting, dizziness, headaches etc). If no changes occur, it seems that within a few days, the whole village of Portela could become a victim of the lava flows. Evacuation of remaining goods from the still standing, threatened buildings continue. Most of the Nature Park has by now been covered by lava. The Park's Headquarters building, already damaged by lava flows and looting earlier on in the eruption, has now been completely destroyed. The village, located at the northern end of the main road inside the caldera, is at risk of being cut of by lava flows: If the main road becomes covered, only a difficult and long passage to the NE via Monte Velha remains as land evacuation route. The upper vent produces ash, the lower one feeds lava fountains (or continuous strombolian activity) and several 'a'a lava flows. One of the lava flows quickly cut the main road through the caldera, but no other major damage has been reported. A SO2 plume mixed with some ash is visible on satellite data in distances of up to 150-200 km from Fogo. Not much detail about the eruption is so far available, but a strong thermal anomaly was detected on satellite data, suggesting the presence of lava at the vent, perhaps in the form of lava fountains. Typical eruptions of Fogo start with lava fountains / strombolian activity that build a new cone, followed by lava flow effusion.